First off, I didn't make up that title. Tanner was in charge of titles today, and pictures too. He picked one of himself :( It's really, really boring, but the post is bunches better; I wrote the post :). Keep reading...When this news flash came by me I just had to scoop it up before Tanner got wind of it. The new TRAVEL-tainer that Mom has sitting on her desk right now has bowls that hold a whole quart of food. Yeow! I'm loving that idea since I get way less than that at my usual chowtime. So I'm going to figure out a way to hide that TRAVEL-tainer and make sure it's mine. When we go on our next camping trip I've got dibs on it. Done! Tanner will get to eat out of the grocery store plastic bowl that's barely big enough for a mouse. So there! 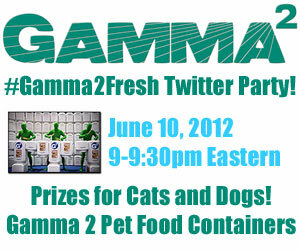 FYI, if you want to nab one of these cool travel containers, you need to be at #Gamma2Fresh, Mom's Twitter Party on June 10. She's hosting for the Gamma2 company along with Paris, her Event Barkers buddy. They apparently have a whole pile of Gamma2 food containers to give away, but I've yet to figure out where she's hiding them. Maybe I'll go check the garage. Wish me luck. See you on June 10. I'll be tweeting @5MinutesforFido. Go RSVP right now so you can get in on the prizes. My bad! I should tell you about the extra chances to win. Besides the RSVP drawing, you can PreTweet to win, and there's a Rafflecopter thingy you can enter on too. Good luck with that; I'm not too sure if it will take off flying or what. Let me know if you figure it out. By now y'all must know my priority is chow. Let's face it, life is just better when our tummies are full. But I digress. 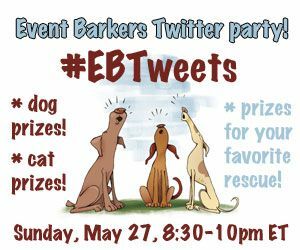 I'm here today to let you know that All Things Dog Blog and Dogtipper.com have teamed up as Event Barkers and planned a new Twitter Party: #EBTweets. It sounds a little like "EB Toots" to me, and that's exactly what they'll be doing, according to mom. They want to tell you all about their upcoming Twitter Parties, while handing out all kinds of cool goodies to cats and dogs. Yes, you heard that right--cats too! Oliver and I are busy trying to locate the swag so we can hide it from her, but so far no luck. Any help out there? I mean really; is she going to give away all my Castor and Pollux Organix? And what about that big box of Zukes treats? Gone? Ugg. I hear her in her office chattering away about prizes over $1000 and wonder what else will disappear. The only good thing I have determined is that she's encouraging y'all to feel free to donate your prizes to a rescue. 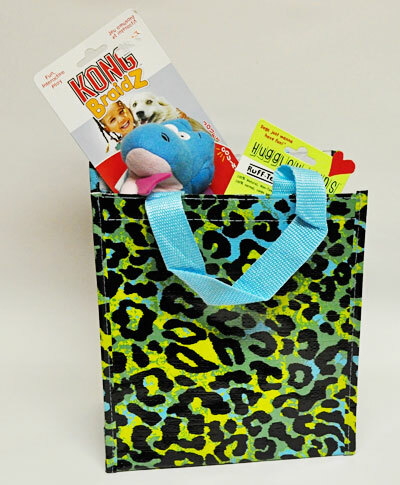 My homeless cousins could sure use this great loot--toys, treats, food, training stuff and some pretty cool tote bags. Mom brought home all sorts of tote bags with dogs and cats on them. Oliver fits into them, but not me . Whew! So I suppose we're going to lose this loot to you. You may as well go ahead and RSVP for this #EBTweets Twitter Party. Mom will throw it whether I like it or not! Tiki and Irie over at Dogtipper.com are trying to sneak some of the loot that is lurking in their cabinets. They really ought to engage the help of Felix, Linus and the rest of the feline gang, don't you think? Paws crossed that they are able to retrieve some of it! If you'd like to track the news on prizes, parties and more, subscribe to Event Barkers newsletter, and be sure to drop in at Dogtipper.com and AllThingsDogBlog.com for updates. And don't forget to RSVP for the #EBTweets shindig on May 27th with @EventBarkers. See you at the party. I'll be the sad one helping to give away dog food and dog toys that I could certainly put to good use right here. You are some lucky dogs, you know? Prize Eligibility: Everyone worldwide is welcome to join in #EBTweets for fun. Prizes are limited to U.S. and Canadian addresses. Prizes designated to a rescue by their winners may go only to U.S. rescues. Thank you for your understanding!